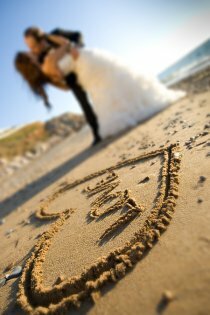 Planning a wedding involves a significant amount of foresight and decision-making. If you’re looking for rental equipment or wedding rentals in Annapolis for your nuptials this summer, you’ll want the right supplies for designing the perfect celebration beneath bright blue skies and ample sunshine. Each season can provide its own complications for weddings, but these tips can help you avoid summer mishaps. 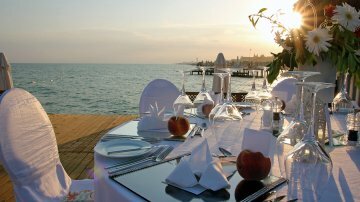 Imagine how hot you and your guests will feel when standing in suits and dresses beneath the summer sun. To avoid a crowd of sweaty and overheated invitees, be sure to have space for your celebration indoors as well as outdoors and provide shaded outdoor seating if possible. Have sunscreen on hand because there are bound to be guests and their children who will be sunburned otherwise. Also, keep mosquito repellant on hand to help keep partygoers comfortable if these irritating pests make an appearance on your big day. When renting your wedding glassware and flatware, be sure to have plenty of water glasses available to go along with several ice water beverage dispensers to help keep your guests hydrated. Remember to select serving platters that come with covers so you can protect your meals from bees, ants, and flies. Remember that summer weather calls for fresher, cooler fare. Opt for dishes that are low in dairy and served fresh to help prevent spoilage and melting. If you’re thinking of incorporating blossoms into your hairstyle, either use faux flowers or skip this step altogether to avoid being stuck with a wilted bouquet pinned into your locks. Even if you’ve always pictured yourself in a wedding gown with a trailing train, remember that this type of dress doesn’t mix well with outdoor weddings. Instead, choose a shorter skirt length to avoid staining your gown with dirt and grass. Bees can be attracted to perfume, so consider skipping this beauty step until later in the evening when you freshen up and these bugs are asleep for the night. What Rental Equipment Will You Need for Your Next Party? If you’re looking for party rentals serving Washington, D.C., you may be wondering exactly what supplies and rental equipment you’ll need to make your event a success. Hosting a party is a significant responsibility and can be overwhelming if you don’t know where to begin. Read on for a list of necessary party rental equipment that you will need for your celebration. Plenty of comfortable seating is an essential element of a successful party. For large events, folding chairs are a practical and affordable option. 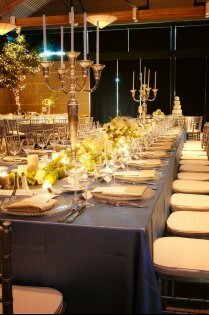 For a more luxurious party, consider renting slipcovered dining chairs or upholstered armchairs. Depending on the kind of party, you will need at least one type of table. If you will be hosting a formal meal, you will need dining tables, which can be found in varying lengths and styles to suit your party’s size and theme. For casual parties, consider renting coffee and accent tables to use for dining and decorating. If you plan to have a drink mixing area or buffet, a bar or console table will provide the perfect surface. You can rent any dining ware you can possibly need, including serving platters, bowls, flatware, glassware, and more. Depending on the drinks you plan to serve, you may need champagne flutes, tumblers, beer glasses, wine glasses, or margarita glasses in addition to water glasses. Flatware is available in a broad range of styles and colors, so consider what variety of plate setting will best complement your party’s theme. If you want your event to be memorable, custom linens and exquisite décor will help make a lasting impression on your guests. Renting table linens will provide you with a fantastic tool for customizing the look of your tables and enhancing the space’s atmosphere. These can be found in a range of materials, colors, textures, and designs. Spacious dance floors and platforms are especially important if you plan on hosting all or part of your party outdoors. Indoors or out, a dance floor will encourage your guests to enjoy your stunning party to the fullest.